I consider myself fairly blessed for having come across The Blogspot. Its been a year since I came here and started sharing every word with you all, my readers, with no second thoughts and I guess it happened naturally! Like my readers deserved it. I believe that you do have the rights to know about me. You deserve the honesty. To confess, there are many things that blogspot taught me. I never really tried venting out here but that's okay, I mean I never really had to. Because the moment I started typing my thoughts and certain things, it always made me feel good. Complete. Blogspot never really gave me ways to express in any kind of desperation. It perhaps knew what I actually needed to rather than what I wanted. It kept the desperation away but introduced me with simple but beautiful ways to think with. It teaches me that being who I am is okay. That its far better than being who I'm not. 1. Post the award on your blog with the rules. 2. 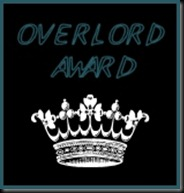 List three things you'd change if you were the overlord. 3. List the blogs you're awarding & leave them a message. 1. I'd remove all the concepts of the society standards. 2. I'd want to make this world a better place to live in. 3. I'd make all the Nicholas Sparks stories come true and make teenagers believe that I exist, somewhere. I dislike surprises. I love realistic things. I was once a tomboy and though none will believe it now, that tomboy is still alive in me. My favourite place in the world is any place where I can lay down and read books. I can't handle compliments and accessories. I'm on a mission. But its a decent one, so I prefer calling it a journey. Given a cup of coffee, I feel I can rule the world. I want to settle in a decent/calm place rather than a metro city. Apart from being a writer, another aspiration is to become a photographer. I'm a trouble-maker and I can't help it! People think they know me, in reality, they only pass me by. May I know the title of your old blog darling? And yeah, the old one was titled as 'When it comes to me'! Congratulations on that award and it was nice to know few things about you this way. I liked it when you said : I'd make all the Nicholas Sparks stories come true and make teenagers believe that I exist, somewhere. Very interesting! This is so beautiful. Reading the list of 10 things was almost like reading myself in a way. There isn't one thing that is not synced with my own, the same yet somehow distinctively different. Weird ha? Oh, good to know it made you relate! :) Coincidence, I guess? Hello, I'm a first time visitor to your blog, and your writing astounds me. I loved your list of 10 things, especially the last one "People think they know me, in reality they only pass me by." Check all ten. I am freakishly similar to what u mentioned! and congratulations!